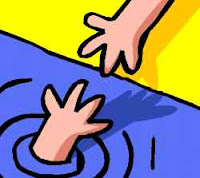 Well, I can hardly move this morning after unexpectedly spending an hour treading water in the pool yesterday. I went over intending to do my 20 minutes of swimming and I was just about to get out when I met a new neighbor and her family. Lil, Bill and Peg. I ended up treading water to stay warm while we chatted. Peg is our newest resident at the McCompound. Her kids, Bill and his wife Lil are my age and damn if they didn't turn out to be, as Lil put it, true liberal Southern Democrats. We talked about doing stuff together, like the Last Friday events in town. Who knows if that will happen? You know, how it is. Often it turns out to be just idle chitchat and doesn't go anywhere but I really liked them so I hope it works out. In any event, I was encouraged enough to give Lil the URL for my blogs. I've only done that two other times in the three and half years I've lived here. In other news, and Maeve will appreciate this, I was fortunate enough to get a free three card tarot reading from Hecate. I pulled the Ace of Wands, the Ace of Swords and the Eight of Wands. Very powerful draw. It appears it's going to be full steam ahead for the next couple of months. Hoping it will take me in a good direction.